The end of the school year is upon us... as a child I remember singing 'No more paper, no more books, no more teacher's dirty looks' on the last day of school as we ran out the back grass area and gate... these days I'm feeling more of a mixed bitter sweet. So as my daughter graduates from Kindergarten and leaves the class of one of my favorite teachers, I sniff and take a few deep breaths... as room mom I collect art work from the kids and compile a book. This is the book cover I created using the kids thumbprint-art to create chicks as they incubate and hatch live chicks in the class! What a sweet teacher's end of year gift!! JOIN the Upcoming Preview Party and Card Class on June 13th and play with these new products!! 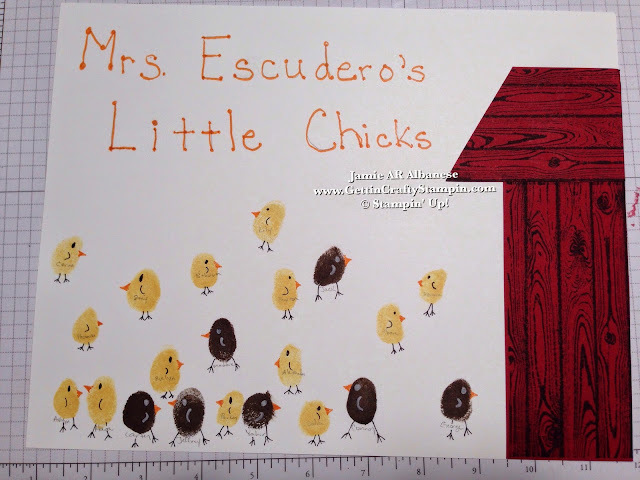 With the cute thumbs of the 21 kids in our Kindergarten class it was fun to create these little chicks. With the play that the kids did of being on a farm to the incubating and hatching of eggs.. this is the ideal thumb-print art for our beloved teacher! 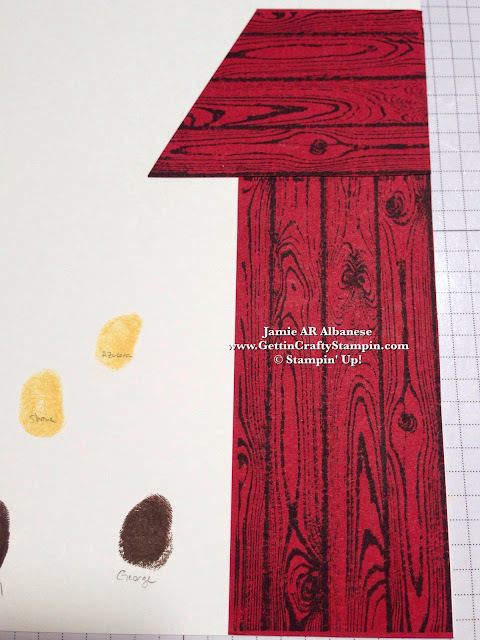 Stamping the Hardwood background stamp with Early Espresso ink on the Cherry Cobbler card stock for a red barn look. Using the Craft Scissors with an extra large blade and precision cutting - I cut down half of the background stamp for the roof. 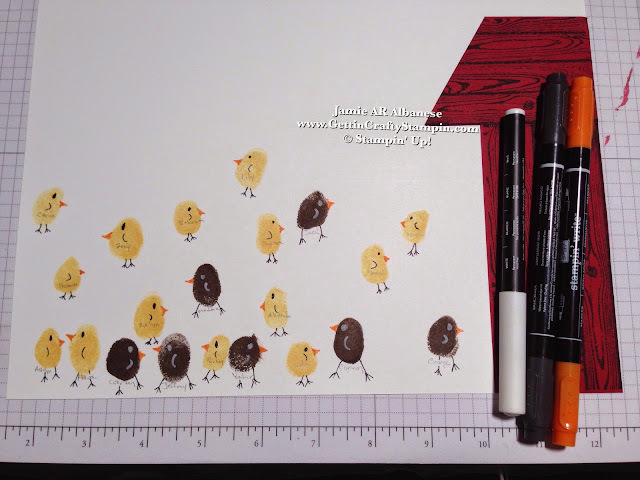 Using the Basic Black Stampin' Write Marker's fine point end to draw in feet on all of the chicks as well as wings and eyes on the yellow chicks. Use the White Stampin' Chalk marker on the Early Espresso thumbprints. 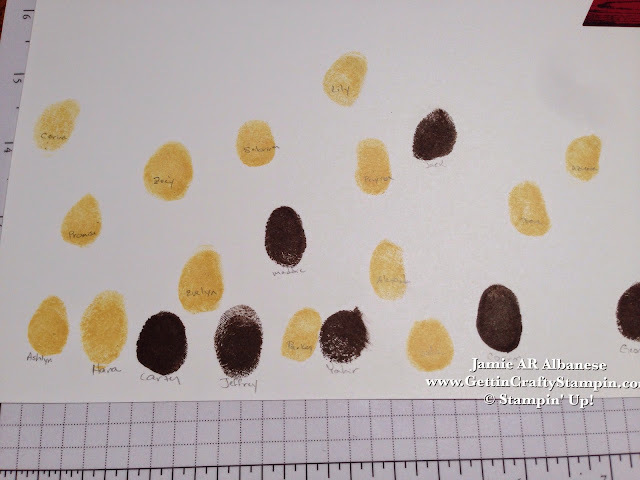 Pumpkin Pie Stampin' Write Marker creates the cutest beaks!! What a sweet and easy teacher end-of-year gift. I love our school, teachers, staff (some days they are the only adult conversations I get). I will not miss the work, schedule, homework, getting the kids out of the morning to school (barely on time - by the skin of our tires - lol). No matter how you feel at the end of this school year (happy, bitter sweet or looking forward to margarita momma hour??) 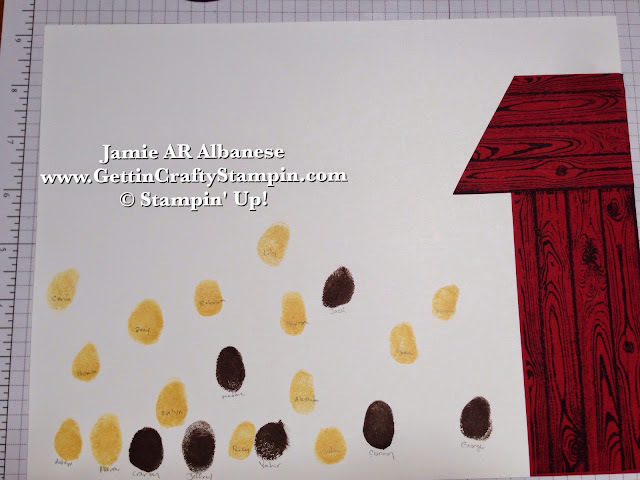 you can wrap it up with this cute thumb print art. Being a room mom was an honor to serve my beloved teacher and the families in our class. Creating a memorable way to cherish the end of this school year is a great way to give back to a wonderful teacher. Happy end-of-school - I hope it was a sweet one!